1. One interesting (and intellectual) fact about Seattle: it's the most literate city in the U.S. It has the most bookstores and libraries per capita, and the most library card-holders. 2. The Space Needle: Iconic landmark, so it must be the most photographed object in the city, right? 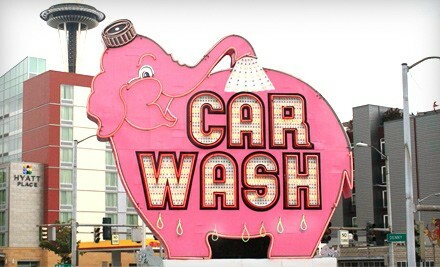 One random fact a few tour guides like to point out is that it actually comes second – to the giant Pink Elephant car wash sign on Battery Street and Denny Way downtown. 3. Seattle might be the only city that can claim to be built on top of another city. After the Great Fire of 1889, citizens raised the street level and started over – you can tour parts of old Seattle thanks to the city's Underground Tour. 4. Why so eager to raise the streets? The Seattle sewers flowed with the tides – in other words, at some point in the day, toilets became more like fountains and the streets were...well, gross. Fun fact: the incredible rebuilding job that followed the fire firmly placed Seattle ahead of Tacoma in the race to become the most industrialized city in the Pacific Northwest. Call it bathroom humor. 5. Next time someone complains about the rain in Seattle, surprise them with this interesting fact: Seattle's annual rainfall is less than that of Houston, Chicago and New York City. 6. Then toss in this fun little tidbit: Folks in Seattle buy the most sunglasses per capita than any other U.S. city. 7. The first female mayor of Seattle, and of any U.S. city, was Bertha Landes, elected 1926. Weird fact: Seattle hasn't had a female mayor since, which is perhaps why Bertha is said to haunt The Harvard Exit Theater in Capitol Hill. 8. Notice a lot of cafes around here? There's probably a glassblowing studio next door. Seattle has the second most glassblowing studios in the world. The first is Murano, an island near Venice, Italy. 9. When it comes to live music and performances per capita, Seattle is second in the U.S. only to New York City. 10. But we beat 'em in ballet - Seattle's Pacific Northwest Ballet has the highest per capita attendance in the country. 11. Seattle's annual Hempfest is the largest "Legalize It" festival in the country, and is a favorite among Seattle cops due to the general friendly, no-violence atmosphere. 12. Random fact: More folks bike to work here than in any other city in the U.S. - and Seattle was the first city to put cops on bikes, too. ©2015 Travel Around USA. All Rights Reserved.